Ah this movie should have been so much better. Taraji P. Henson has the star quality to carry a movie but Proud Mary feels like they didn't quite have the confidence to pull it off. The short running time and pedestrian direction of Babak Najafi, make Proud Mary amount to a very standard action movie, just another like you've seen so many times before. Proud Mary's ad campaign tried to sell it as a modern take on Foxy Brown. The opening credit even call to this by giving us a cool 70s vibe. But the movie drops that moments in and becomes bogged down in a rather uninspiring plot that just feels like it's going through its paces. Set pieces are muted and stilted. It felt like a TV show through most of it, not taking advantage of the big screen. And the story gets rushed to meet a very truncated run time, meaning that character development and action get shunted to just make sure we get through the story. Henson is strong despite the film not going all in. 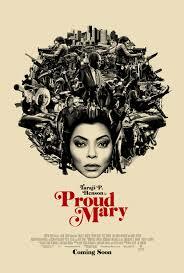 The story itself isn't bad and if the film had taken time to tell its story, build its characters, and set up some great action sequences, I think Proud Mary could have been great fun with an emotional punch. I know this because near the end, the film begins to start to do this. The climactic scene is where the movie truly comes alive with impressive sequences and some true tension. But by then it's almost too late as the film hasn't gotten its audience to buy into its hero and her plight. The strong cast saves the film from being a total bore but it's just not what it could have been. It feels like everything we have seen before without the kind of style that Henson could have truly sold.